Aswarm (Ltd) is a transformative public arts company based in the UK, lead by Artist & Sound Designer Thor McIntyre-Burnie. We specialise in site-specific and immersive work, using sound and other sculptural & AV elements to subtly alter our experience of architecture, public space and performance. Our projects range from solo artist works to full production teams, drawing on a tight team of specialists and network of professionals. What is an aswarm work? : A Bandstand may be re-awakened as an ear to a historic mound of earth; an exploded orchestra re-activates a victorian mill; a flock of speakers occupy a square, providing a means to walk within the Twittersphere; a derelict piers starling bird colony becomes a touring Ghost Roost; A forgotten Wind Tunnel becomes a quasi religious experience; a Lift a musical playback device & place to play syneasthetic twister; a pile of rubble an instrument to re-work Rites of Spring. 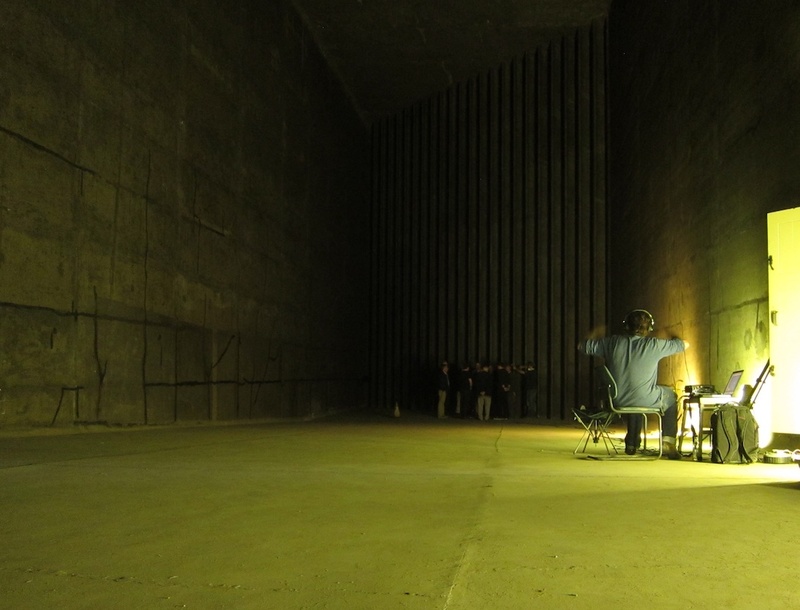 Thor: ” In the image above I am (as often as not) working on location, recording a choir of male voices of men who used to work at the grade 1 listed Farnborough wind tunnels. I had gathered them there to sing in-situ, utilising the incredible acoustics of this forgotten place, so that we could fill this stark temple to futurism with a human vocal breath. – visitors were invited to explore.. Directed by Thor McIntyre-Burnie, aswarm works in collaboration with a small team of creative professionals and a wider network of artists , makers, designers and performers. The team includes: Chloe Osborne (specialising in Theatre and public outreach); Toby Jarvis (Sculpter and prop maker); Olly Aylmer (Composer and music producer); Martin King (Electrical Engineer and supertechgeek). The wider team includes a number of regular collaborators incl. Thor: As an artist I want to re-awaken spaces and create scenarios where people feel intrigued to re-explore and re-imagine our relationship with an environment, questioning what we want from public space and the pervasive AV media in our midst. – Sound can both play with a space and coax ‘us’ into playing with ‘it’. Sound Design: As well as an Artist Thor has also built a breadth of experience working as part of creative team as a Sound Designer, especially in site-specific performance. Thor: There is nothing like site-specific work to challenge your abilities. I draw on both technical know-how and my artistic understanding of space, to listen to what works insitu and as part of a collaborative creative team. You have to adapt and overcome often in new, challenging and time pressured scenarios. It’s not all been muddy boots & head torch’s though, the European award winning Soundspace which I co-designed in a unique Nesta funded partnership with Dutch firm Northern Light, at Eureka Children’s Museum is a slick interactive exhibition that is still running 10 yrs on..
Arts In Education & Lecturing Posts: Drawing on our breadth of experience across both these fields we design creative learning spaces and deliver educational projects with schools. And as a postgraduate lecturer Thor regularly teaches in the fields of Communications Design, Architecture, Theatre and Sound Design (Incl: Central St.Martins MA, Birkbeck MA, Brighton University BA, Aachen University (Germany) MA). PDF Folio: Please get in touch if you would like to receive a more in depth PDF folio. Video: http://vimeo.com/user4997473 . – Some documentation here, also hosts a number of educational projects with schools.